Scary Monsters magazine #47 - Boris Karloff: Man of a Million Horrors! 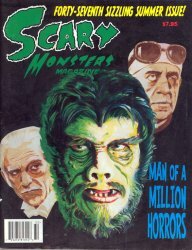 MyMovieMonsters.com > Scary Monsters Magazine > Scary Monsters 1-100 > Scary Monsters magazine #47 - Boris Karloff: Man of a Million Horrors! This is the Forty-Seventh Sizzling Summer Issue of Scary Monsters, published in June 2003.